The Marvel Universe is dead. Nothing really shocking about that, especially since Marvel has been telling us for months that this was their plan for the last couple of years. What I had failed to truly realize is that the destruction of the Marvel universe also meant that most of the titles I have been reading have now ended. When Secret Wars is over, I’m sure that functionally similar titles will return, so I’m not particularly worried, but it does mean that I’ve had to mix up my reading with some of the brand new tie-in titles. My favorite this week, Inferno. While I am a huge fan of the X-Men, I’m afraid that my knowledge of certain storylines is a bit lacking. Having gotten into comics at the tail end of Civil War, I’m very knowledgeable about everything from there till now, and I’ve gone back to hit some of the major highlights, but I haven’t quite made it to the original Inferno storyline. In short, the original story was a massive crossover event involving a demonic invasion of New York, the corruption of Madelyne Pryor, and really bad things happening to Illyana Rasputin (Magik). Of course in the end, the X-Men are triumphant and the day is saved, because, comic books. This new version of Inferno is more along the lines of an old What if? comic. Instead of the X-Men winning the day, they fail and the invasion, though halted, is not turned back. What appealed to me most about this story was its alternate timeline setting. While I love the big, sweeping stories that filled the X-Men titles during Chris Claremont’s tenure, I love to wonder what would happen if different choices had been made, or if one character or another hadn’t been in the exact right place at the right time. All of these questions get my brain going and the possibilities are nearly endless. I think it is also great fun to see the X-Men doing things that are not their normal. In this case, when not battling demons, they are acting as a police force in the boroughs surrounding the demonic area. It gives the whole group a slightly different dynamic that lets the writer explore things from a unique angle. Also, given that this is part of Secret Wars it’s likely that in the end this whole universe will also be destroyed and therefore what happens will have almost no consequence. That kind of freedom also for potentially interesting narrative choices. 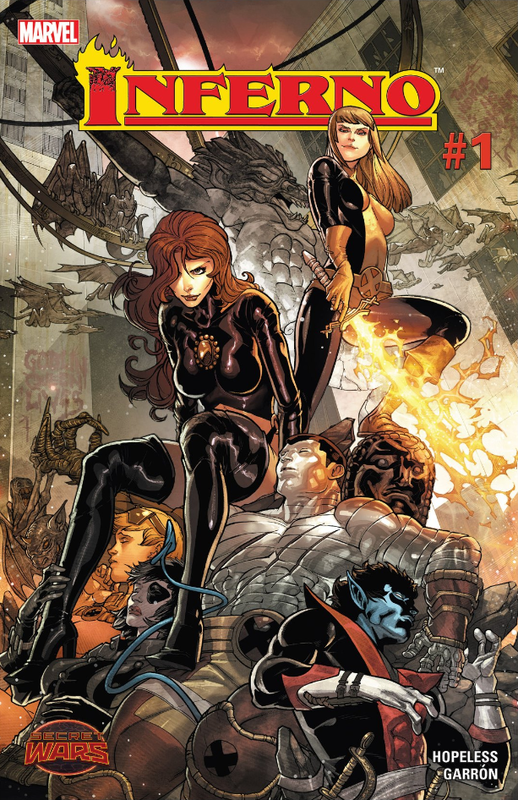 Inferno is told from the perspective of Colossus, Illyana’s older brother Piotr. He has become obsessed with trying to save his sister from the demons that are holding her captive, once each year attempting a mission to save her. 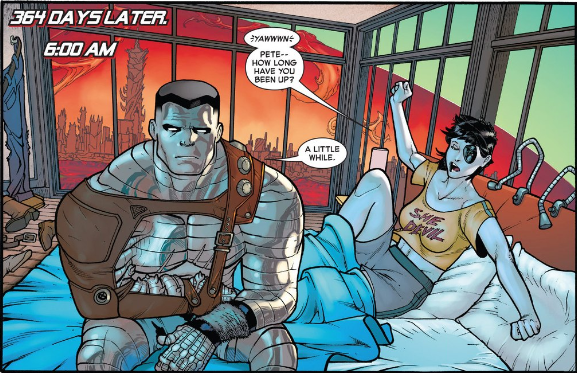 Even from his introduction in Giant Sized X-Men #1 Colossus has been protective of his little sister. Inferno shows the lengths to which he is willing to go to save her. 364 days of the year he goes about his life, but in reality he is only living for that one day when he gets the chance to save Illyana. Even when he is confronted with the reality of the situation and the true cost of his obsession, he still can’t let it go. Writer Dennis Hopeless has a great insight into both the character of Colossus, as well as into the mind of someone that is utterly consumed by a single thought. While this is only the first issue, I have my suspicions that this will end very poorly for Piotr. Javier Garron does a reasonable job on the art. I think that his portrayal of the characters is really quite good. While most of my favorite artists use a very squared off style (Romita Jr., Ramos, Bachalo), Garron’s style is much more rounded and I found that I enjoyed it. Especially the look of his Colossus. Given that his metal skin is made of up horizontal bands, it’s really easy to make him look good in a squared off style, it’s not nearly as easy to do in Garron’s smoother method, but Garron is able to make it work. I also appreciate the fact that the police uniforms the X-Men are wearing are reminiscent of the guard uniforms from House of M. It’s always about the little touches. I was a little disappointed that most of the backgrounds for the action sequences were solid colors with anime-style “speed lines” added to imply motion. While I’m not looking for Little Nemo level detail, it would be nice to have these great looking characters fighting in a good looking setting.